I've been stuck in this cycle of being behind in recent months, which has stopped me getting out new content that is 85% complete. We are slowly getting on top of things and fingers crossed I can get some new stuff up next week - after this bloody thesis proposal is finally accepted! Going back to the end of May, I had a Hop Trial Cascade Pale Ale at Beer Deluxe before my exam that unlocked New Brew Thurday (Level 34) & Verified Adventure (Level 8). It was a Single Hop Pale Ale clocking in at 4.5% ABV and showcased Cascade very nicely. I knew next to nothing about the brewery beforehand; and while there is very little information readily available I've deduced that they are based in Tasmania and are focusing on Single Hop beers. Drink Like a Kiwi (Level 42) arrived at Slowbeer Fitzroy, whilst sipping on an Epic Magic Dust as I perused the shelves. It's a seriously impressive IPA, as most brewed by Epic are, that's brewed with lupulin powder. This lupulin powder is a new product and provides a lovely dry finish to the beer that accompanies plenty of citrus and tropical fruit flavours. I would highly recommend this beer to those looking for a fresh NZ IPA. As I mentioned a while back, I've jumped head first into brewing. Our home brew brand is slowly gaining an identity, with a name (Full Toss Brewing), a theme and a new logo. We've pumped out a number of beers since starting in late-March, one of which unlocked Home Brewed Goodness (Level 3). That beer was The McDonald, an American Red Ale with rich caramel malts, a light smokiness complimented by orange and tropical fruits notes from the hops. It's a nice Red Ale but will certainly improve with some minor recipe tweaks. Another beer from Full Toss Brewing unlocked Riding Steady (Level 49). The Carberry, is a raspberry wheat beer that is loosely based on Bad Shepherd's similar beer. It had multiple raspberry additions, with added some in the boil before being racked onto fruit for the duration of fermentation. The result is a beer with a lightly tart but distinct raspberry flavour, there's some grassy bitterness (possibly a touch too much) and some light wheat notes. Home Brewed Goodness (Level 4) rolled around in the same session as we sampled the first offering from our The Nets Sesh range, our non-beers. Full Toss' Apple and Blackcurrant Cider was better than I expected it was going to be - I'm rarely a cider drinker after all. We decided to experiment by not sweetening a number of them, including this one which turned out beautifully dry and packed full of fruit. Evil Twin's Luksus One, a rhubarb Berliner Weiss initially only brewed for the Restaurant Luksus in New York, unlocked Ich Bin Ein Berliner (Level 4). This was always going to be polarising and I think it succeeded in being that throughout the course of the bottle, going from lovely to awful to weird and back again through various temperature ranges. In the end; it was quite tart and packed a weird vegetal flavour, that wasn't distinctly rhubarb. I wouldn't rush back but I'm glad I tried it. I'm always surprised by the relevant infrequency that levels of Paint the Town Red roll around. Illawarra's The Chuck Norris unlocked (Level 16). It's a hoppy Red Ale that I picked up on my trip to Canberra a while back. It's got an impressive malt body, which is slightly more complex than most, while Mosaic hops dominate with their trademark tropical fruit notes. Dieu du Ciel's Isseki Nicho is a Black Saison, something of a rarity these days, brewed in collaboration with a Japanese brewery; Tamamura Honten. I thought it was a really cool beer with roastiness the dominant characteristic, while there were hints of funky yeast coming through. It was definitely closer to a Stout than a Saison, however I think it was a worthwhile endeavour. Trip to the Farm (Level 24) is why you're reading about it now. One of the most hyped Australian beers of the year so far unlocked Black as the Night (Level 2). Sydney based, Modus Operandi's Cascadian Howl is a Black IPA that debuted as their GABS beer. This was the best Australian example of a Black IPA, since the peak of the style boom a few years ago. It struck an almost perfect balance between roasty malt and clean hop bite. This is a beer that I can't recommend more to lovers of the style - and those looking to get into it. I've lost count of how many badges Stone & Wood Pacific Ale has unlocked down the years; this time it was Beer Foodie (Level 3) and I'm sure it won't be the last... This was unlocked during a visit to The Standard Hotel in Fitzroy, coincidentally one of my favourite pubs, for a mates birthday drinks. It was a pretty good pint of Pacific Ale with the pungent passionfruit of the Galaxy hops really shining. Moon Dog are back! Just as I was feeling disappointed that their weird bottle offering had dried up in recent months, out came Dunbar's Dream; a Passionfruit and Coffee Porter. It's a beer that really worked for me, with the sweetness of the passionfruit diluted by the coffee bitterness that struck later in the palate. It's not a beer that I'd drink everyday but nor is it supposed to be. The badge; To the Port (Level 3). I'm very pleased to be able to find some Naparbier beers with relative ease around Melbourne after Good Beer Week. Their Willy el Tuerto, a Russian Imperial Stout brewed in collaboration with Cerveses La Pirata - a Spanish microbrewery, unlocked Imperial Czar (Level 7) & Better Together (Level 23). This was a seriously good beer, with coconut and vanilla additions adding a real depth to the prominent coffee flavours. If you love stouts, this is one I'd grab before it leaves our shores (or I buy all of them...). Another Russian Imperial Stout unlocked 2X (Level 23). This time it was a local one from Bad Shepherd. Simply called "Russian Imperial Stout" this beer comes with a striking deep red label, with a gold two-headed Imperial Eagle embossed upon it. The beer is equally impressive with lots of licorice and roast combining to make a lovely sipping beer. Riding Steady is done and dusted! 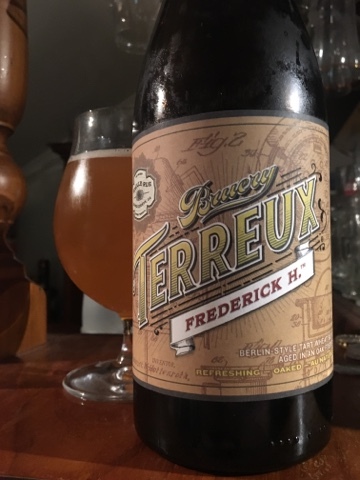 The beer that unlocked (Level 50) was The Bruery's Frederick H. The beer is a straight up and down Berliner Weiss, something of a rarity these days. 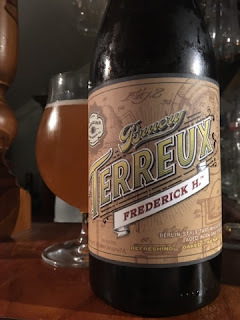 It's a pretty spectacular beer, with that incredibly tart earthiness that many of the sours from The Bruery have complimented by some oak and the faintest hint of funky Brett. It was a fitting beer to cap off this badge that you've seen 50 since October! Regular readers would be aware that Czech Dark Lagers are the reason that this blog exists. Kozel Dark may not be the best example of the style, but it certainly is the one I can get most regularly. It comes in at only 3.8% ABV yet provides sweet dark and caramel malts. I seem to regularly drink it once a year, I think I better make it more than one this year! The Dark Side (Level 3) is why you're reading about it now. Home Brewed Goodness (Level 5) was unlocked by our first all-grain attempt, a simple SMaSH brewed with Pale Malt and Falconer's Flight. Full Toss' The Southee is dominated by mango on the nose, which translates to the palate along with some orange. The grains are in the background, as intended, and they impart only a slight cereal quality to the beer. We've already made a couple of alterations to the recipe and re-brewed a larger batch of this beer for our soccer teams end of season celebration. One from the back of the cupboard, Edge's Rye Pilsner brewed in collaboration with Evil Twin unlocked Crisp as Day (Level 21). I have no idea how old this beer was, I don't remember buying it, but I'm happy to report that it held up remarkably well. The was nice citrus bitterness that combined well with a lot of malt flavour and just a hint of rye. It certainly wasn't a traditional Pilsner, but it was a tasty beer. By the Campfire (Level 11) rolled around while watching the Champions Trophy Final at a mates place, somewhere in Brunswick. The beer of choice was Victoria Bitter (VB) and they went down quite nicely - almost as nicely as watching Pakistan roll India with two very vocal Indian supporters in the room! My most recent pre-exam beer; West City's American Brown Ale also unlocked two badges New Brew Thursday (Level 35) & Bravo for Brown (Level 10). I was pretty impressed with this beer, a really nice hoppy Brown Ale that combined lovely citrus hops with complex slightly nutty malts. I've been consistently impressed with West City's beers, hopefully they'll soon be more readily available. A beer that I don't drink anywhere near enough of is the Courage Russian Imperial Stout. It was included as part of the latest Carwyn Beer-Thusiast Pack and unlocked God Save the Queen (Level 42). This was one of the first Imperial Stouts I ever tried and I think back then the complexity was lost on me. It's a really interesting mix of sweetish coffee notes, licorice and a hint of Bretty pear - remember it's brewed to an old English recipe, where Brettanomyces (the English yeast) originated. There we go guys; another wrap up of some pretty interesting beers I've tried recently. I'm hoping to get a bit of stuff done on the blog over the next month or so as I wait for my thesis proposal to come back. Hopefully my impending holiday will see me finish the Porter vs. Stout post that I have been talking up for months! I'm in the midst of a week of attempting to unlock some badges that you haven't seen for a while/are brand new - so keep an eye out for that in the coming days.